A. Scanned images of alpha-sarcoglycan and beta-actin Western blot using LI-COR Odyssey Infrared Technology. B. Densitometric analysis of the fluorescent signals of the bands shown in A. See Experimental Notes for additional information. 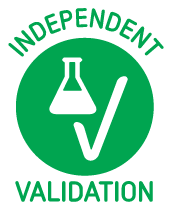 Read validation report #100262 for application Western Blotting. This product was validated with a different quantity. 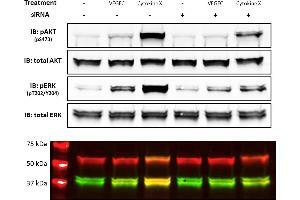 Notes ABIN2169660 works successfully in Western blot to reveal murine IgG primary antibodies used on HEK-293 cell lysate. 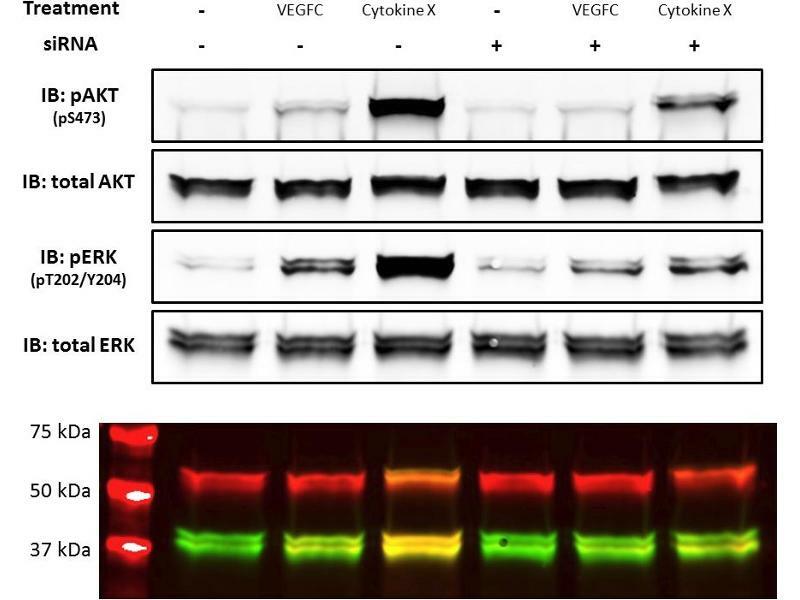 Human HEK-293 cells are transfected with a vector expressing human alpha-sarcoglycan and grown in DMEM supplemented with 10% fetal bovine serum at 37°C in a humidified incubator with 5% CO2 to 80% confluency. Lyse cells in lysis buffer (PBS containing 5% sodium deoxycholate and protease inhibitors (Sigma-Aldrich, S8820, lot SLBF3959V). Determine total protein content of the lysates using the bicinchoninic acid assay (Thermo Scientific, 23227, lot RE232692). Denature 5µg, 7.5µg, 10µg, 12.5µg, and 15µg of total protein for 5min at 95°C in 25µl 1x Laemmli buffer and subsequently separate them on a denaturing 10% polyacrilamide gel (Bio-Rad, 161-0183, lot 64063478) for 1h at 120V. Transfer proteins onto nitrocellulose membrane (Bio-Rad, 162-0112, lot A10062318) using a Bio-Rad Trans-Blot Turbo Transfer system for 10min at 1.3A. Cut the membrane into two pieces to detect alpha-sarcoglycan and beta-actin. Block the membrane with TBS containing 5% milk for 1h at RT. 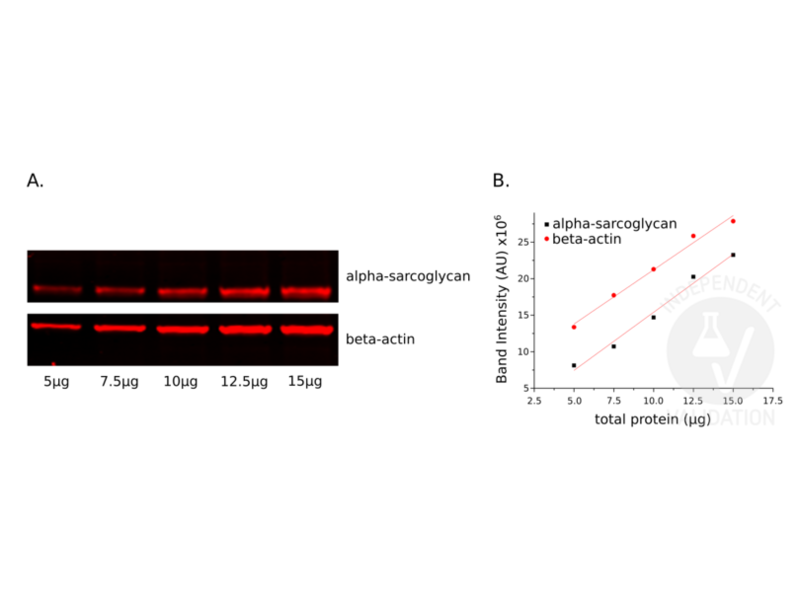 Incubate membranes with primary monoclonal alpha-sarcoglycan antibody (Leica Biosystems, NCL-L-a-SARC, Lot 6023907) diluted 1:400 or monoclonal beta-actin (Sigma-Aldrich, A5441, lot 014M475Y) diluted 1:20000 in TBS containing 0.1% tween and 5% milk ON at 4°C. Wash membranes 3x 10min with TBST. Incubate membranes with goat anti-mouse IgG (Heavy & Light Chain) antibody (IRDye680LT) (antibodies-online, ABIN2169660, lot C60301-03) diluted 1:20000 in TBST containing 5% milk for 1h at RT. Wash membranes 2x 10min with TBS. Rinse membranes briefly with H2O. Acquire signals with an Odyssey LI-COR CLx imaging system (scan resolution: 169µm, image quality: low) and measure the band intensity using ImageJ. Experimental Notes The analysis of band intensities show a good linear relationship with the amount of total proteins loaded (R2=0.98). 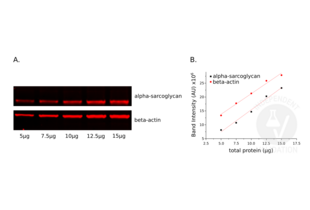 The slope of the lines interpolating the data points of alpha sarcoglycan and beta actin are very similar, allowing a reliable quantification of the expression level of alpha-sarcoglycan after normalizing with beta-actin. Optimum dilutions will vary and should be determined empirically. NOTE: When using PVDF membranes for Western blotting, SDS (final concentration of 0.1 – 0.2%) and Tween® 20 (final concentration of 0.1 – 0.2%) must be added during the detection incubation step to avoid non-specific background staining. IRDye 680LT secondary antibodies are suitable for immunofluorescent microscopy and other fluorescent imaging applications when using instrumentation with appropriate excitation and detection capabilities. IRDye 680LT is not intended for In-Cell WesternTM assays or in vivo applications. These antibodies are not recommended when getting up and running on system. Once established near-infrared protocols are optimized with IRDye 680RD, IRDye 680LT can be used to optimize signals in the 700 channel. Dilution range 1:20,000 – 1:40,000. Note: optimization may be required with IRDye 680LT. Please see pack insert for specific detergents/protocol modifications needed. IRDye 680LT secondary antibodies have been proven to provide the brightest signal for Western blot detection in the 700 nm channel and are comparable to Alexa Fluor® 680 secondary antibodies. Choose IRDye 680LT secondary antibodies to get high signal and for specific uses of detection in the 700nm channel. We do not recommend to start with IRDye 680LT secondaries but rather to start with one of the IRDye 680RD secondaries. Product cited in: Mans, Banz, Mueller, Pabst: "The angiogenesis inhibitor vasostatin is regulated by neutrophil elastase-dependent cleavage of calreticulin in AML patients." in: Blood, Vol. 120, Issue 13, pp. 2690-9, 2012 (PubMed).